Savor this raspberry smoothie and give your day a little zest! Give Your Day a Little Zest! A raspberry smoothie can be made delicious in so many ways. Add some of these juicy berries to complement other fruits to give it a little zest. They characterize a smoothie like no other fruit can. 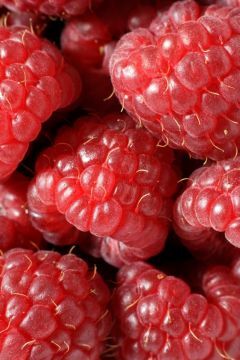 If you are using frozen raspberries, make sure that you use some sweetener with your smoothie, such as stevia or honey. Frozen raspberries tend to be quite tart. So raspberries blend well with many fruits, such as in blueberry smoothies, strawberry smoothies, peach smoothies, orange smoothies, and banana smoothies. The sky is the limit! Just take a look and see how many varieties you can make! Found a yummy smoothie combination? Show it off! If you do not like the raspberry seeds in your smoothie, try blending the liquid ingredients with the raspberries before adding the other frozen fruit and ice. This should help break down those seeds a little bit more. If you want to completely pulverize those seeds, consider using either a Blendtec or Vitamix blender. These are the best blenders on the market.